Are you looking for some deck inspiration? Look no further! Searching for deck inspiration? Look no further! The weather is getting warmer and the landscape is just about to wake up from its winter slumber. Soon, the grass is will be green and the colors of spring will be all around, swaying in the gentle breezes. We have waited all winter to be outside, and the time is upon us, but one true question remains…is your outdoor living space ready? Whether homeowners have procrastinated on backyard transformations because their design vision just wasn’t there or they couldn’t decide on the features to include, we can tell you that there is no time like the present to open the conversation to achieve the full potential of your own outdoor living space! To help bring some inspiration to the table, we thought we would share a few MasterPLAN deck projects to elicit excitement and provide a little insight into the possibilities decks can offer! Let’s take this lovely MasterPLAN Outdoor Living project in Center Valley, for example. The homeowners knew they needed to replace their existing failing stone terraces at the rear of the home and wanted the new space to be beautiful yet functional and bring out the house and property’s natural charm. MasterPLAN got to work in designing an expansive elevated deck, using a warm Brazilian Cumaru hardwood. Cumaru is an extremely dense and strong hardwood that is resistant to rot, mold, decay and insects while being incredibly durable and long-lasting. 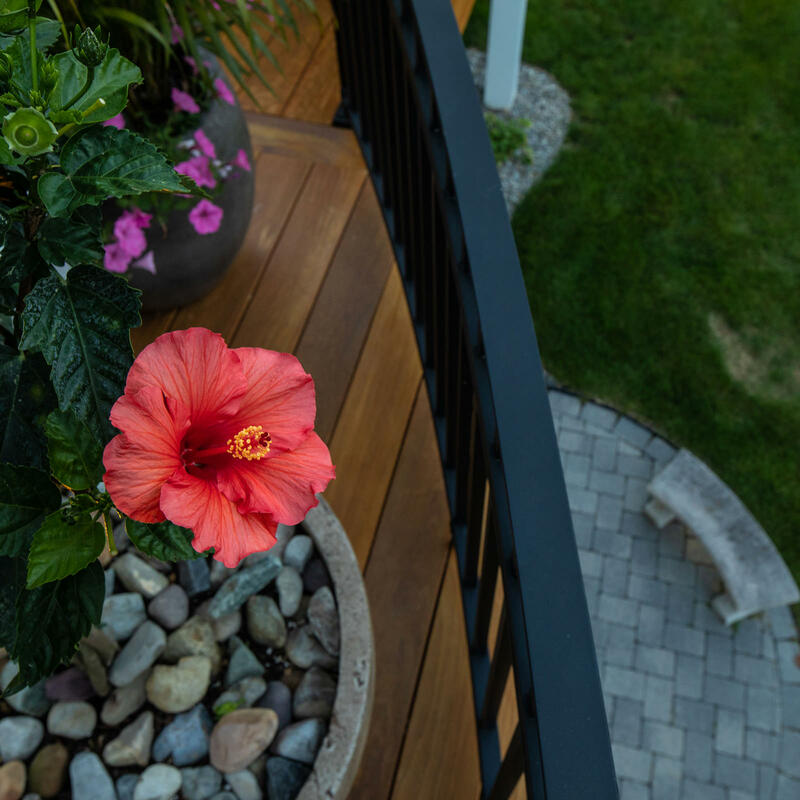 With an amazing lifespan of over 50 years, this scratch-resistant decking not only offers peak performance in the elements, its gorgeous combination of red, yellow and brown natural hues help it stand out from the rest. Knowing that a phase 2 swimming pool was on the horizon, we wanted to make sure that we utilized every available inch of this deck space, so we proposed the idea of under deck storage to the client, which was quickly accepted! We installed brilliant Cumaru deck skirting to create the storage room and included an inverted roof system to keep the stored items dry. This is the perfect location to store pool chairs, cushions and any pool equipment tools needed at a moment’s notice, but stored neatly out of the way to provide a clean poolscape for the client. Spatial efficiency at its finest, and might I add, most beautiful! 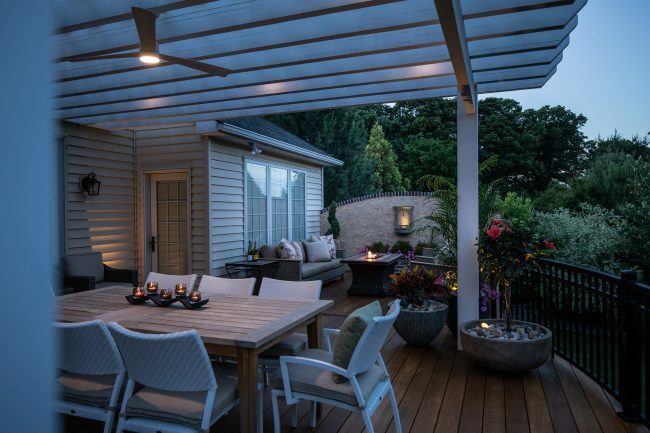 Speaking of sustainably-sourced tropical hardwood, this MasterPLAN creation in Allentown was constructed out of Ipe hardwood and was thoughtfully designed to include the essential 3 zones of outdoor living! 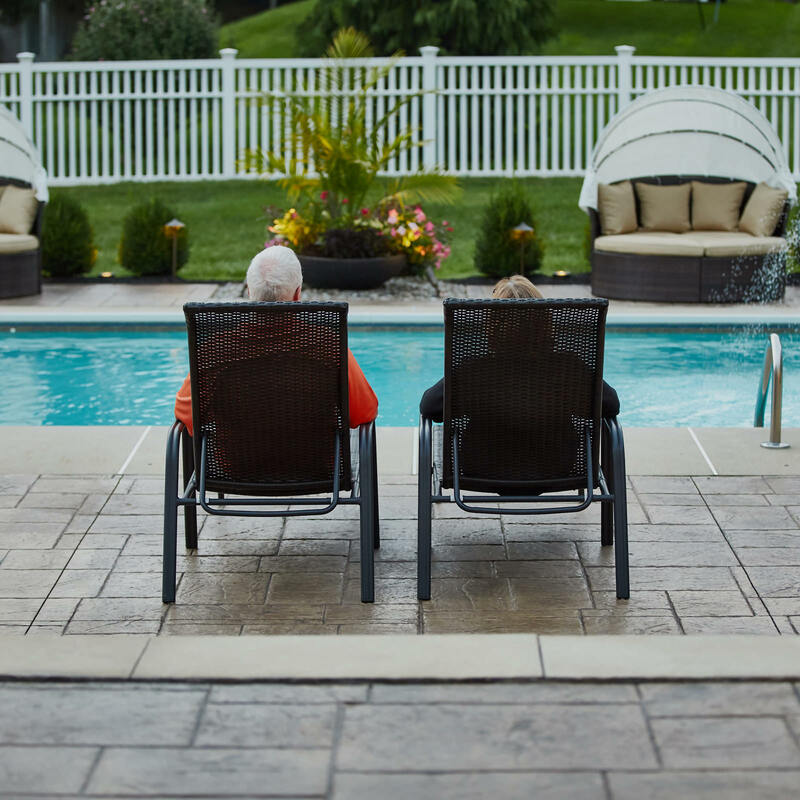 What are the essential 3 zones of outdoor living you ask? Great question! For every well-rounded designer outdoor living space, you will find that each contains a place to prepare a meal. Whether this area is a simple portable propane grill or a built-in kitchen will plenty of appliances and amenities, preparing a meal for your friends and family on a warm spring day or serene summer evening is key to keeping the crowds happy! Going hand-in-hand, the second essential destination zone is a place to dine. This deck design included ample space for a beautiful 8-person teak outdoor dining set with a custom pergola overhead. Recessed lights were installed in the pergola beams to add a romantic ambiance and the outdoor wet-rated ceiling fan creates a nice breeze and keeps the mosquitos away from the diners and their dinner! Moving further along the deck, we reach the lounging area. Complete with a comfortably lush outdoor chat set and portable fire table, the homeowners can relax and warm up while gazing at the portico water fountain we installed on the custom-curved feature wall. All the creature comforts, within steps of the inside of the home. Lastly, we would like to showcase this MasterPLAN deck in Bethlehem to add to your inspiration for the season. This amazing family lived with a small pressure-treated builder’s deck for over 20 years and they didn’t have any shade to hide from the summer sun. From the client’s wish list and implementing our out-of-the-box thinking, we were able to create a gorgeous and highly functional, yet low-maintenance deck space equipped to handle all activities like watching the baseball game, playing with the grandkids or relaxing in the hot tub after a long day. Down a few steps from the second-story deck level, the homeowners are met by their hot tub, which we sunk into the deck to add to their privacy and make the space look clean and unobstructed. Under the main deck space, we finished the ceiling off with white Azek slats for a tidy finish to the basement entryway. From this grade-level patio, we installed an under-deck access door to access the hot tub’s electrical panel when needed. Over the main level of the deck is a custom hybrid roof system which combines an A-frame and lean-to style. This custom roof was created to fit the existing architecture of the home and to blend seamlessly as if the outdoor living space was built at the same time as the home itself. Our goal is to always have our outdoor living projects look as if they have always belonged there, and never an afterthought! This family can now enjoy their time outdoors, no matter the weather and no matter the time of year! If we were to get intrinsic, we would see that each of these projects share several similarities, but we would love to highlight that they all share one main and quite important quality, and that is a seamless transition. Being able to blur the lines between the inside and outside of the home extends the usable living space, making each feel more open and welcoming! This flush indoor-outdoor connection also makes for easy transition and safe footsteps along the way. 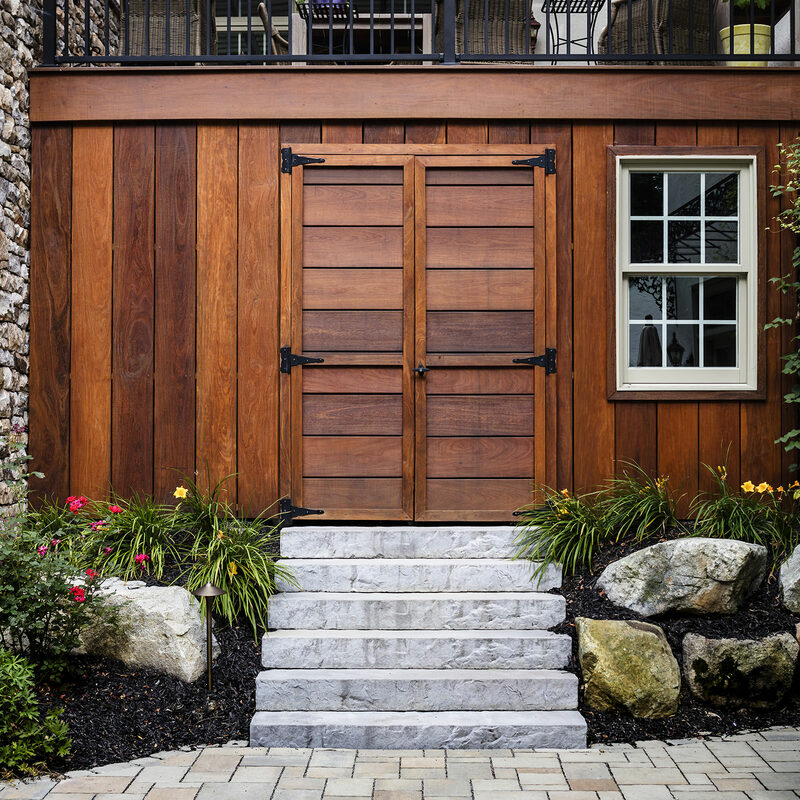 Whether young or old, juggling kids or a tray full of margaritas, homeowners are thankful that there are no staircases to contend with and security is always present. You will find that experience and forethought is found within these types of details. Sure, any deck contractor can build you a deck, but are they truly invested in how you want to use the space, feel in the space and consider the efficiency of the space for you, your family and your home? This is where homeowners may first recognize the sheer benefit of talking with an outdoor living design/build firm. As a reputable and experienced outdoor living design/build firm, MasterPLAN Outdoor Living would love to help you experience what it’s like to be heard and have your needs always in consideration. We believe that incredible outdoor spaces don’t just happen, they are the culmination of creative minds working closely together to create a beautiful and timeless strategy, followed by meticulous implementation! 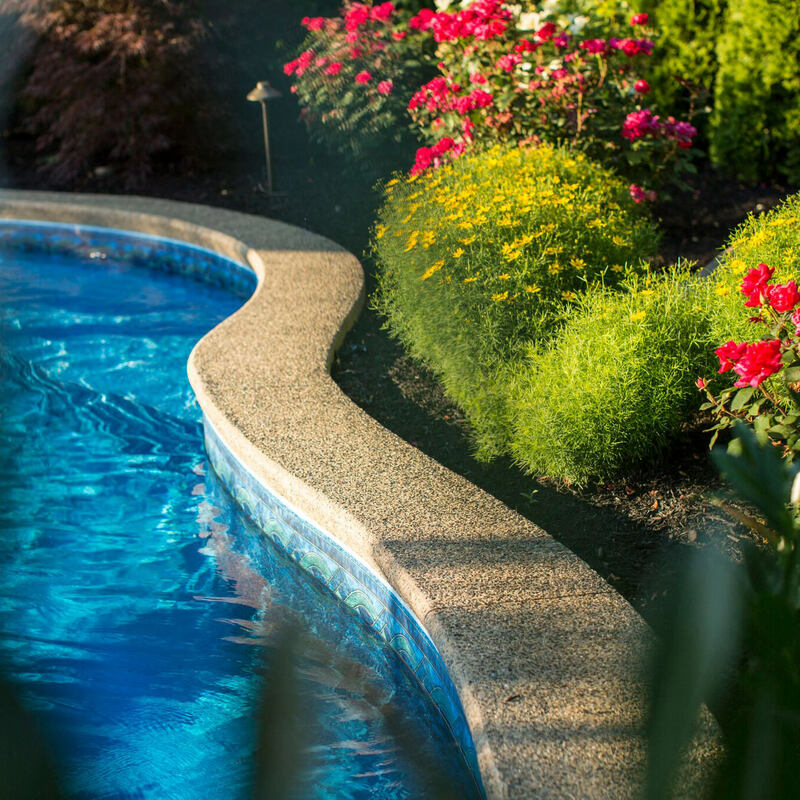 When you are ready to discover the full potential for your backyard and experience the backyard transformation with professionals that care, reach out to MasterPLAN; we would love to welcome you into the family!